Poets: Bashō. Chiyo. Jane Hirshfield. J. Zimmerman. J. Zimmerman (haiku). J. Zimmerman (tanka). Marianna Monaco. Hosai Ozaki. Patricia Donegan. Patricia J. Machmiller. Shiki (haiku). 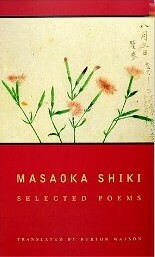 Shiki appears in Modern Japanese Tanka edited by Makoto Ueda. The 'first collection' of modern Japanese tanka available in English. A delightful and comprehensive presentation that shows the development of the tanka form. by Masaoka Shiki, translated by Janine Beichman. Books of Poetry. Voice. Haiku Reform. Tanka Reform. Time Line. 144 haiku. Several examples are below in Voice. 4 kanshi (poems in classical Chinese). 8 pages of references and bibliography. Watson says that Shiki wrote more than 25,000 haiku. Different translators (Beichman, Blyth, Watson) mostly choose to translate different haiku, on the order of 100 each. Use of the 5-7-5 mora (see A Linguist's Comments on Sounds and Syllables in Haiku) sound pattern. Note that mora are used for "counting" in language-related tasks, including for poetry. Short syllables as one mora. Long syllables are counted as two morae. Use of season word (kigo). Preferred factual types of haiku; highlighted those of Yosa Buson over those of Bashō. were better, yes better, in taste! Brilliant book with a 126-page introduction. Shiki's tanka arranged by year stating with some of his earlier tanka like this written in 1897: . Based predominantly on data in Burton Watson's translation of Masaoka Shiki's Collected Poems. Birth of Matsuo Bashō. He would become the first poet to compose independent hokku (or in Shiki's term, haiku). Shiki would become critical of Bashō's haiku. Meiji Restoration. The abolition of feudalism in the next years impoverished many samurai, including his father. Birth of his sister, Ritsu. Approximate start of his writing poems in haiku form. Coughs up blood, showing first sign of infection by tuberculosis. Although this would kill him in 1902, he resists it strongly. Enters Tokyo University literature department. Begins self-education in the history of the form of haiku and starts developing his Haiku bunrui (Classified Collection of Haiku). Withdraws from Tokyo University literature department, to devote full time to creative work. Becomes haiku editor of Nippon, where he will publish his own haiku and those of others. haiku: A carp leaps up. haiku: Always someone resting there. Arrives in China as a War correspondent, but reaches after the outbreak of Sino-Japanese War. Hospitalized on his return. The tuberculosis has settled into his spine, causing pain and making it very difficult to walk. Began an project to reform tanka similar to the way that he had reformed haiku. Publishes Haijin Buson, influential study of haiku poet Yosa Buson. haiku: I think I'll die. Death of Masaoka Shiki. 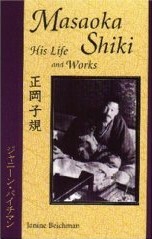 Masaoka Shiki: His Life and Works (new version 2002; first published ). First publication of Janine Beichman's translation of Masaoka Shiki's work: Masaoka Shiki: His Life and Works. Publication of Burton Watson's translation of Masaoka Shiki's Collected Poems. Revised publication of Janine Beichman's translation of Masaoka Shiki's work: Masaoka Shiki: His Life and Works; first published .